The next scheduled match will see the Aguilas take on the Bombers on Saturday 29th September. After the first three matches of the new season, the Aguilas sit winless and must win against the Bombers to be any chance of defending their title. However, last time these teams met, the Bombers trounced the Aguilas by a nasty 72 points. The Aguilas will have their work cut out to win back into contention. The following weekend will see the Bullants, undefeated this season, take on the Bombers. The final round will see the Aguilas clash with the Bullants on October 13th. The Grand Final will be held on 27th October. To round out a big first domestic Colombian season, the Cervecería Gigante Cup will be an 18 versus 18 match played at season’s end, made from players from all three teams plus any new additions – another big step for the AFL Colombia development programs. This game will be played on November 3rd ahead of a planned, but currently featuring an unannounced team, international match two weeks later. 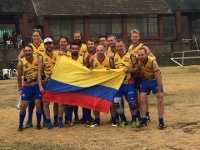 The AFL Colombia season is far from done, with plenty on the line for local teams and beyond.